GREG Horsman’s appealing new production of the 19th century comedy Coppelia gives it a human scale and an Australian setting. It is the late 1800s and we are in the South Australian town of Hahndorf, settled in 1839 by German migrants and thus celebrating its 175th anniversary this year. I don’t think Queensland Ballet has a visit to Hahndorf on the 2014 schedule but it really should. The essentials of the original ballet remain. Franz, not the brightest bloke, falls for a remote beauty who is, in fact, a life-sized mechanical doll. His sidelined girlfriend, the plucky Swanilda, has to come to his rescue when he falls into the clutches of the man who made the doll, Dr Coppelius, and in the third act everything comes right. 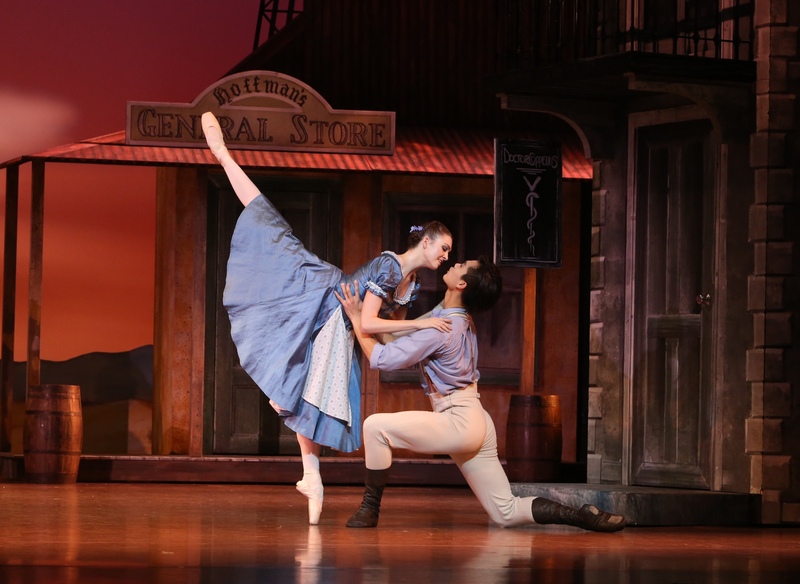 Clare Morehen and Huang Junshuang in Queensland Ballet’s Coppelia. In Horsman’s revision Dr Coppelius (the wonderful Paul Boyd) is a migrant from the Old World, a medical man rather than a dark-hearted magician. In a prologue that mixes stage action and effective sepia animations, Coppelius and his young daughter are seen preparing to leave their home in Germany. But the girl is sickly and dies on the sea voyage to Australia. Coppelius’s doll-making is an attempt to restore her to him. Meanwhile the little town goes about its business, which mainly involves lots of larking about to the pretty Delibes score, neatly arranged by QB’s music director Andrew Mogrelia and played by Camerata of St John’s. The good folk of Hahndorf are a lively lot – there are some rather cheeky Scots – but even the Lutherans don’t seem to mind a bit of banter. If I were queen of the world, however, I would place a ban on children holding hands and prancing about in a circle. Surely there are other ways in which youngsters can move. Horsman’s push towards realism, or as far as you can go when lifelike dolls are involved, has its pluses and minuses. In setting up his story Horsman takes a little time to get the action moving but he does build a pleasing picture of community and individuals within in it. In his sweetest inspiration he brings on the local footy team – Australian football, of course. Some of the QB lads need to work on their handpass skills and on opening night the Sherrin was definitely too soft for an effective bounce, but the audience enthusiastically applauded a high mark. Yes, in Brisbane. The downside is a lack of magic in the second act, in which the usual cave of wonders is reduced to a couple of half-finished automatons. It fits Horsman’s scenario but is far from a sparkling setting for Swanilda’s centrepiece impersonation of Coppelius’s doll. For key moments – including Swanilda’s solos and the big Act III pas de deux – Horsman has kept choreography familiar from traditional versions and at the opening performance Clare Morehen (Swanilda) and Huang Junshuang (Franz) despatched the high points with ease and verve. Eleanor Freeman and Vito Bernasconi lit up the stage as the second pair of lovers and Lina Kim’s joyous dancing delighted every time she appeared with Swanilda’s flock of girlfriends. Also delightful are Hugh Colman’s sets, which bring to mind colonial paintings (Louis Buvelot perhaps), and Jon Buswell’s exquisite lighting, in which bright day fades to velvety evening. This kind of quality is possible because in a venture that makes a great deal of sense, Coppelia is a co-production between QB and West Australian Ballet. Perth will see the ballet next year. Expect the footy to go down extremely well indeed. Coppelia ends on May 10. A version of this review appeared in The Australian on April 28. IN Greek mythology the river Styx marks the point of no return. On one side is life, and on the other death; the ferryman Charon is the intermediary, transporting souls to the afterlife. Natalie Weir has taken this enduring story as the wellspring of When Time Stops, a new work for Expressions Dance Company that has just premiered at the Brisbane Festival. The central character is a woman who, In Weir’s words, “could be anyone, in her last moment of life’’. That moment is extended and suspended as experiences are relived, in flashes, by the Woman or replayed by others. When we first see the Woman (Riannon McLean) she is at the point of joining the Ferryman (Thomas Gundry Greenfield) for her final journey. He is seated in a small white boat, back rippling as his arms press and circle in huge, powerful strokes that have a mesmerising but implacable rhythm. Never, one imagines, has the afterlife looked quite so enticing. McLean, so poised and centred, reaches towards him but is interrupted. The stage fills with musicians and other dancers. A life’s flashback begins. This is a striking and eloquent beginning, much enhanced by Bill Haycock’s cool, elegant design and David Walters’s sympathetic lighting. And how marvellously and unselfconsciously the members of Camerata of St John’s move in and out of the dance, playing Iain Grandage’s new score from memory and doing it very, very proud. Weir’s direction of this aspect of the production is exceptional. The dancers give every sinew of their being to the work and are captivating. McLean draws the eye even when still and in the background, such is her charisma; there can never be too many opportunities to see Daryl Brandwood; and Gundry Greenfield, whether entering the dance or continuing his endless ferryman labour, is as imposing a presence on stage as I have seen in quite a while. When it comes to the choreography itself, however, I have significant reservations. Weir relies too much on several relatively obvious ideas – running backwards, slow-motion moves, rolling, leaping – in a way that does little to differentiate stages in the woman’s journey (there are 12 sections). There are several intimations of tenderness but mostly I felt as if I were seeing 17 kinds of sorrow on a loop. Most troubling for me is a hardness in much of the partnering that borders on violence. There is one section clearly depicting some kind of accident or harm where the use – abuse? – of male strength is dramatically justified. But there were so many times when young women hurled themselves at the men, when they were slung over shoulders and when they were hurled around. The partnering looked very unequal in power and authority. I was also dismayed when women upended themselves on the floor, their floaty skirts naturally dropping down over their heads and shoulders as they extended their legs. I don’t mean to suggest Weir had the intention of making her female dancers look manipulated and anonymous; far from it. But, to me, apart from McLean they looked just that and I found it hard to watch. When Time Stops could do with some focusing and tightening. So many new works fail to get the second look they deserve because of time or money constraints, but I hope Weir does have a chance to reconsider some things about When Time Stops because it’s certainly worth it. Undoubtedly a major problem about restaging would be the participation of the number of musicians Grandage requires for his score, and the dance would be immeasurably diminished by the use of recorded music. Grandage, whose score for Sydney Theatre Company’s The Secret River was greatly admired, describes his music for When Time Stops as having, among other things, elements of minimalism, surrealism and polytonality. That may sound rather dry. In practice there is a great wealth of colour and texture as the orchestration – for strings alone – moves from the group to individual instruments, from the lower strings to the higher, from quite romantic plushness to thrilling astringency. The music appealed greatly on this one hearing and the Camerata of St John’s and their music director, Brendan Joyce, put in a blinder. When Time Stops continues at the Playhouse, QPAC, until September 14.